Believe it or not, neither of us like plain marshmallows! Some of you may be shocked by that, but there’s something about the slightly rubbery texture that’s off-putting. We sure like rice crispy treats (who doesn’t?) because they’re chewy, crispy, and sweet all in one bite- basically perfection. Well, these are the kind of marshmallows that you wouldn’t want to make into rice crispy treats with. Eating them plain is a good method, and they are even better submerged in a cup of hot chocolate. We have a feeling they would make really, really good s’mores too, but we haven’t tested that yet (homemade graham crackers+homemade marshmallows+good quality chocolate=there’s no possible way this could be bad!). 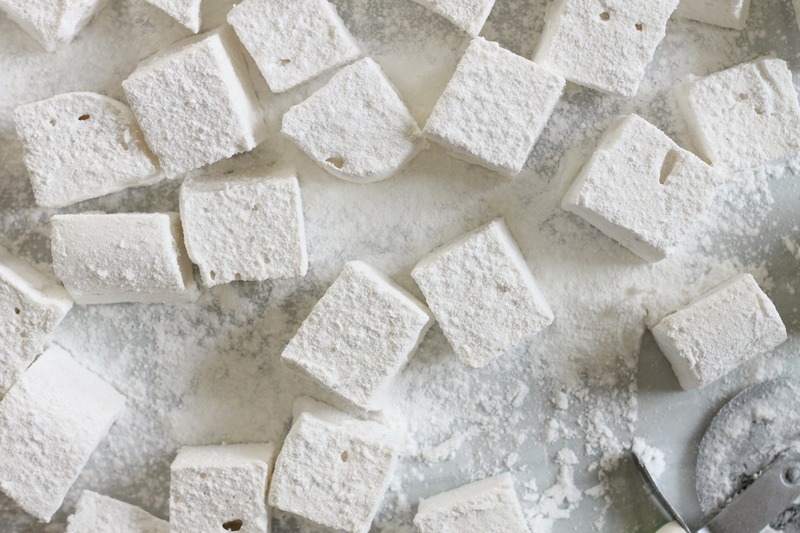 These marshmallows are spongy-soft, like little pillows. There’s no rubbery texture here, and there are also no gross chemicals you might find in a store-bought marshmallow. Plus, they take under 30 minutes of hands-on time. What could be better? Coat a 9×13 in. baking pan lightly with cooking spray and wipe away any excess. Whisk together gelatin and 1 cup of the cold water in a small bowl and let stand for at least 5 minutes, until the gelatin softens. Stir together sugar, 1/2 cup of the corn syrup, the remaining 1/2 cup cold water, and salt in a medium saucepan over high heat. Boil, stirring occasionally, until the temperature reaches 240 degrees F.
Meanwhile, pour the remaining 1/2 cup of corn syrup into the bowl of a stand mixer fitted with the whisk attachment. Microwave gelatin mixture on high power until it is completely melted, about 30 seconds. Pour it into the mixer bowl and set the mixer to low speed. Once syrup mixture reaches 240 degrees F, remove it from the heat. Slowly pour it into the mixing bowl in a steady stream, aiming for the space between the beater and the bowl. Increase mixer speed to medium and beat for 5 minutes. Increase speed to medium-high and beat for 5 more minutes. Turn mixer to the highest speed and beat for 1-2 minutes more; beat in the vanilla extract and vanilla bean paste. The marshmallow will be opaque, fluffy, and roughly tripled in volume. Pour marshmallow into prepared pan. Use an offset spatula to coax it into the corners and smooth the top. Sift powdered sugar and cornstarch together into a medium bowl. Sift mixture evenly and generously over the top of the marshmallow. Reserve leftover coating. Let set for at least 6 hours in a cool, dry place. Run a knife around the edge of the pan to loosen marshmallow. Invert the entire slab onto a coating-dusted work surface and dust marshmallows with more coating. Cut into pieces with a pizza cutter (or a different type of cutter to make other shapes). Dip the sticky edges in more coating and pat off excess. Store in an airtight container. Enjoy!